How much sleep do dogs need? Feeling dog tired? Our dogs spend a lot of time sleeping. It’s essential for their health, but how do we know what is normal? How much sleep do dogs need? Well, the answer is that it depends. Sleep requirements can vary from dog to dog depending on age, breed and activity level. Is it normal for dogs to sleep all day? Although there’s no such thing as an average dog, most dogs will sleep for around 12-14 hours in any one 24 hour period. So around half of your dog’s day is spent in the land of nod. For puppies and older dogs, the amount of sleep they need may be even more. With puppies sleeping away 18-20 hours of their day. Breed can also play a role with some large breed dogs like Mastiffs and some toy breeds like the Chihuahua needing more than the average 40 winks. Also, some dogs meant for speed rather than stamina like the greyhound can be total couch potatoes. The reason why dogs sleep so much isn’t fully understood. Although we share a similar sleep cycle with our dogs; non-rapid eye movement sleep (NREM) followed by rapid eye movement sleep (REM). The time that it takes to move through each cycle is much quicker for our dogs. Our dogs only spend around 10% in REM or dreaming sleep whereas we spend around 20%. Our dogs therefore typically have more sleep cycles per night. Whereas we have around five full sleep cycles in an 8 hour period, our dogs have around 23. Research has also shown that in that same 8 hour period, dogs, on average sleep for around 16 minutes before they wake for around 5 minutes. As they do this 23 times a night, it may explain why they are always so tired! These brief sleep cycles may go some way to help us understand why dogs need to sleep more. Because they sleep in a series of short chunks rather than the extended period that we have. They need a total sleep time in excess to our own to gain the benefit from the restorative REM period. Why is my dog always sleepy? If you consider that a dog needs around 12 hour’s sleep, then it becomes easier to see why it seems that dogs are always sleepy. If we assume that our dogs are asleep when we are, and we get an average of 8 hours sleep. It leaves another 4 hours during the day when they need some shut eye. Of course, our dogs don’t always sleep through the night. They are more flexible in their sleep patterns than we are. Often we think our dogs are asleep when they are not. Around 50 percent of the day our dogs are asleep, 30 percent they are awake but inactive and 20 per cent they are awake and active. Of course, this very much depends on your dog. Not all dogs will sleep this much. Service, police, and working dogs won’t sleep much during the day. You may find that your dog is busier and less happy to sleep all day than other dogs and if that’s normal for them, then it isn’t a problem. Dogs vary greatly in their need for sleep, so if it’s not unusual for your dog to be active for most of the day, then you don’t need to be concerned. Dogs don’t only sleep because they are tired. Sometimes they sleep just because there isn’t anything else to do. Just like us our dogs get bored. Some dogs may find their own entertainment, but others will just sleep. 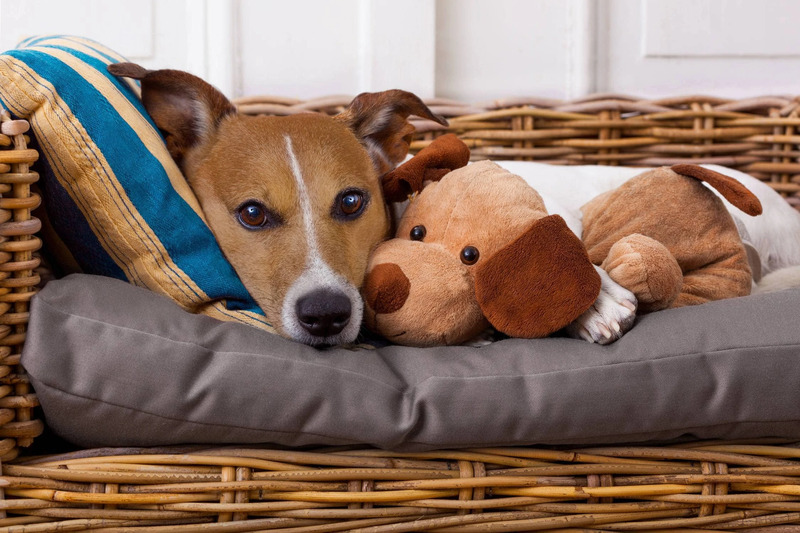 If you think that your dog is sleeping because they are bored, then you may want to consider providing additional physical or mental stimulation. You don’t have to dedicate your entire day to your dog, but there are a few habits that will keep them active, both mentally and physically. Varying your daily walk can be exciting for your dog. As our dogs experience their world through their nose, new smells and time to explore them exercises their mind as well as their body. Providing your dog’s meals in food puzzle toys keeps them entertained far longer than eating out of a bowl. You can improvise if you don’t have one by putting kibble in an empty carton with a few holes cut out of it and let your dog work the food out. Even if you aren’t in a position to play fetch, you can engage your dog in a game of ‘find it.’ Hiding a few treats around the house and allowing your dog to sniff them out is an exciting and stimulating challenge for your dog. If you are at work most of the day then getting a friend or relative that can pop in can also help alleviate boredom for your dog. Or you can go all the way and get your dog a subscription to their own TV channel. If your dog’s sleeping habits change all of a sudden, then it may be a warning sign that something is wrong. Other factors can also contribute to a sleepy dog. It’s a natural part of a dog’s aging that they will need to sleep more. Also if you’ve had a bad night, then your dog is likely to have had one as well, and they may be catching up on some much-needed Z’s. It varies. Our dogs’ sleeping habits depend on a number of things. Age, breed and how engaged they are during the day being just a few. If your dog regularly sleeps for 12-14 hours a day, then it’s normal and if you’ve got a puppy or older dog that number will increase dramatically. Boredom does play a part in how much our dogs snooze so if you think that your dog is sleeping when they are not tired you can do a lot to keep them entertained. 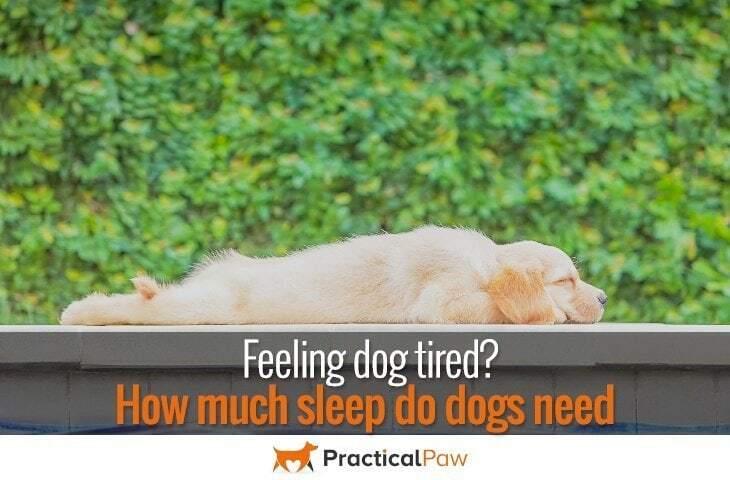 However, it’s important to understand that sleep is essential for our dogs. And they can get overtired just like us. Tiredness can lead to a grumpy or over-excited dog when they haven’t had enough rest. So if your dog is asleep, leave them to it. If you are worried or concerned about your dog’s sleeping habits, especially if you have noticed a dramatic change, then do contact your vet who can give them a check up and put your mind at rest.